The case of â€œMrs. 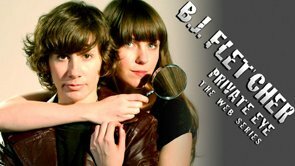 Lacey and her Hidden Gemsâ€ continues for Private Eye B.J. Fletcher and her trusty associate Georgia Drew as they go undercover to infiltrate the local mafia. As the case continues, George worries that Fletch may be getting them in over their heads. Also, the true nature of Fletcherâ€™s relationship with Marjorie and what happened the night George and Fletch solved the Watson case is revealed.